Influenced by the exotic, lush landscapes of his childhood years in Hawaii, Hunt Slonem's richly colored bird paintings are celebrated worldwide. 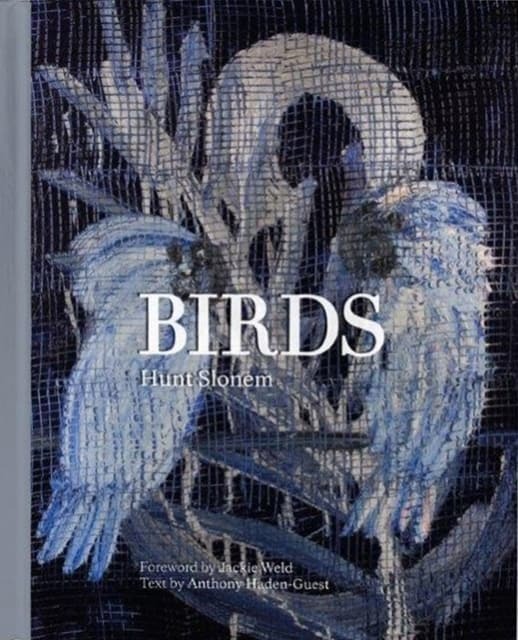 For the first time, Slonem's birds are collected into a single, luxurious volume. In Birds, the artist pays homage to these remarkable creatures through hundreds of engaging artworks. Dramatic and vivid, Slonem's avian subjects seem unconfined to a flat surface, brimming as they are with texture and movement. The compelling nature of these paintings lies in the tension between the birds' ability to soar and their often captive state (though Slonem's own birds are often spotted flying aournd his studio). The world-renowned artist's vibrantly patterned canvases are a celebration and a paean to birds, sure to entice returning fans and new viewers. Praised by his contemporaries for his neo-expressionistic style, Hunt Slonem reaches for new heights in this dazzling new work. As a follow-up to his earlier elegant title, Bunnies, this hardcover volume features metallic ink, silver gilded edges, a ribbon marker imprinted with birds and an acetate jacket. Within the pages, Slonem's unique cross-hatching style examines nature and technique, pleasing bird lovers and fine art aficionados alike. These exquisite paintings by one of the art world's preeminent contemporary figures make Birds a necessary addition to any serious art or avian library. Hunt Slonem is an internationally recognized American painter, sculptor and printmaker. He exhibits regularly at both public and private venues around the world. His work has been exhibited in more than 350 galleries and museums worldwide and is represented in over 100 museums including the Metropolitan Museum of Art, the Solomon R. Guggenheim and the Whitney Museum of American Art in New York City. Hunt has received numerous honors and awards including a MacDowell Fellowship and a National Endowment for the Arts grant. He lives in New York City and Louisiana, where he has notably restored two important plantations. Jacqueline Bograd Weid is the author of the novel Rara Avis and the biography Peggy: The Wayward Guggenheim. Currently, she is starring in a movie based on her book Peggy Guggenheim: Art Addict. She is also the chairman of the Board of Casita Maria, New York City's oldest settlement house for the Latino community. Anthony Haden-Guest is a writer, reporter, cartoonist, and, unless forcibly prevented, performer. He won a New York Emmy for writing and narrating a program about the coming of Eurotrash to Manhattan. He appears on paper and online and is currently working on two books.